These are the terms and conditions of the www.landofrugs.com web site. By placing an order on this website you are accepting these terms and conditions and you agree to be bound by them. 1. We reserve the right to update these terms and conditions at any time and without further notice. Please check that you have read and understood our current terms & conditions. Commissioned 02.02.2011, last updated 28.01.2019. 1. You may place an order with us either by adding goods to your shopping basket and completing the checkout procedure or by placing an order with us over the telephone. In both cases you will have the opportunity to check that the details of your order are correct. 1. You will receive an order acknowledgement by email and/or by post. When you receive this, please check once again that your order details are correct. Please contact us immediately if there are any discrepancies. 3. we are experiencing problems processing your payment. 1. We may process payment for your order immediately or at any time prior to dispatch, at our discretion. 1. All prices include VAT at the current rate of 20% where applicable. 2. Prices may be changed at any time and all orders are processed at the current rate of VAT as displayed on www.landofrugs.com at the time the order is placed. 1. We offer FREE DELIVERY to UK mainland addresses with the exception of remote Scottish regions. Please visit our delivery page for further information. 2. For current delivery charges to offshore locations please visit our delivery page. 3. Delivery costs to international locations are calculated at the checkout. 4. As soon as your order is ready for dispatch our courier will contact you with tracking details for your order. 5. Your order must be signed for unless you have emailed us to say that a signature is not required, and that the order can be left in a secure location of your choice if no one is home when our courier delivers your order. PLEASE BE AWARE THAT WITHOUT A SIGNATURE WE WILL NOT ACCEPT RESPONSIBILITY FOR DAMAGED OR MISSING ORDERS THAT HAVE BEEN LEFT IN A SECURE LOCATION AT YOUR REQUEST. 6. We will deliver to an alternative delivery address if specified by you. However, this may slightly delay your order whilst we undertake additional security measures for the prevention of fraud. We do apologise for any inconvenience that this may cause but these procedures are necessary to protect the privacy and security of our customers and products. 7. We reserve the right to refuse orders we suspect to be fraudulent or suspicious in any respect. 8. When your rug is dispatched our courier will send you a text message allowing you to track your delivery status (please ensure you leave a mobile number when placing your order online to facilitate this). Once your order is with our couriers we are reliant on our couriers fulfilling the delivery and therefore cannot be held responsible for any error on their part. On the rare occasion that a delivery date is missed or a delivery error is made by our couriers service, please contact the courier direct with your consignment number to resolve any difficulties. 9. Please note that failed attempts by couriers to deliver goods to you on pre-arranged dates, due to your absence, may result in the return of goods to Land of Rugs. In this circumstance you are liable to incur the cost of any such returns to Land of Rugs. You may cancel an order, at any time prior to it being dispatched, for a full refund. Orders cancelled after they have been dispatched will be charged a courier return fee, please contact us for details of this. Our rugs are dispatched in protective packaging and delivered by professional national carriers. On delivery of your rug, it is your responsibility to examine the packaging before signing receipt of your order. In the unlikely event that the packaging has been damaged you should NOT sign for the order. You should request the courier to return the good to us and we will then arrange for a replacement. You should also inform any person accepting the delivery on your behalf of this requirement. Damage to a rug following your acceptance of the order is not covered. 1. Please check goods carefully as soon as you receive them. If they are faulty, or not what you ordered, please contact us within 48 hours of receipt. We will arrange a collection of your order for inspection, you must retain the original packaging and ensure your order is sealed and adequatly packaged for the return journey. You should ensure that someone is available to receive the courier as we will only pay for one pick-up attempt (weekday, not a timed collection). On confirmation of incorrect or faulty items, we will offer you a replacement, a mutually agreeable alternative or a full refund.Where customers believe rugs to be faulty, they should contact Land of Rugs. We may then request several images of the fault for our initial assessment. We may then arrange for the return of goods for inspection at our warehouse. Where the collection of goods has been arranged by us for inspection at our warehouse and those goods are deemed by Land of Rugs not to be of faulty manufacture, we will not offer replacement of said goods, and we will deduct those costs incurred by us in having collected the goods, from the full refund. 2. Please note that slight variations of colour are not accepted by us to constitute faulty goods and we do not accept responsibility for the cost of returning rugs where the colour is not as portrayed on your computer screen. 3. Slight pile shedding is inevitable in rugs, more so if made from wool or acrylic. Consequently these products are not considered to be faulty because they shed their pile. 4. Sizes displayed on the website can vary and are only an approximation, please contact us if you have any queries regarding sizes, as slight variations between those displayed on the site and individual rug sizes are not regarded as constituting a fault. 5. 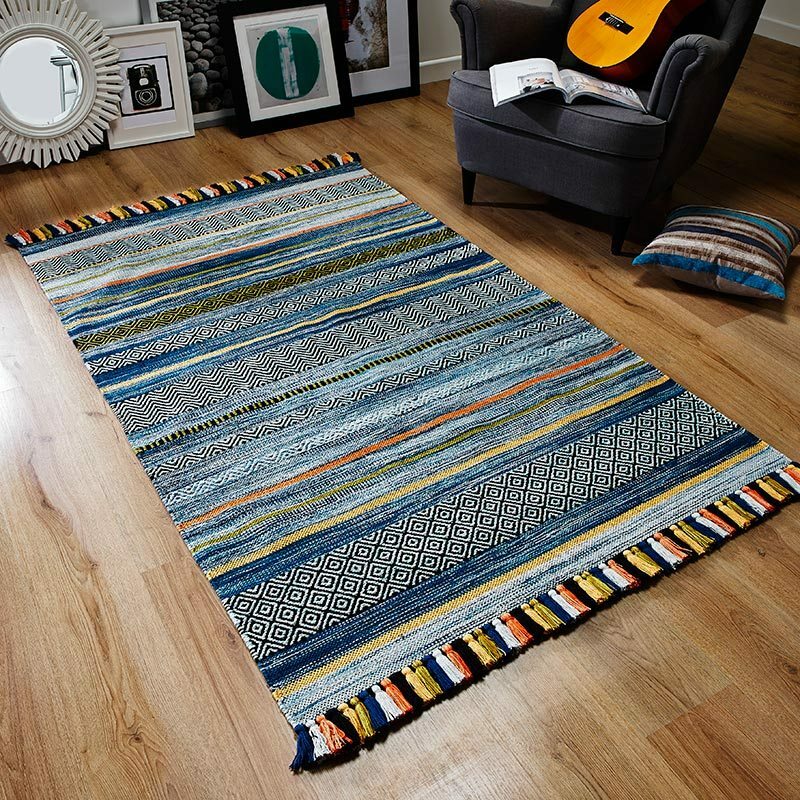 Handmade rugs can contain variations in colour due to natural dying processes. Each piece is unique in construction and may exhibit variations and inconsistencies in design and weave tension, which do not affect the quality of the rug. These features reflect the uniqueness and individuality of handmade items and are not considered to be an indication of manufacturing faults. 1. If you are dissatisfied with your purchase(s) and wish to return them, you should inform us within 14 days of receiving your goods and return them within 14 days after notifying us of your intention to return them to us. Goods should be returned in the original packaging, unused and in the perfect condition in which they were dispatched to you; failure to adhere to these requirements may affect the value of any refund due. Packaging must be resealed with sufficient tape to ensure that it is both watertight and adequately protected on its return journey; failure to do so may lead to us refusing to accept poorly packaged goods. 2. Please enclose a note, with any goods returned to us, detailing your order number and your reason for returning the goods. This will facilitate the refund process and it will not affect your statutory rights as a customer. It is your responsibility to return the goods to us and we are not responsible for any costs you may incur. 3. Custom sized and special order items cannot be refunded and are excluded from our returns policy. 4. We cannot accept responsibility for goods lost or damaged in transit whilst being returned to us. If you require advice regarding returns, please call us on 01332 294787 and we will guide you through this process. 5. Returned goods will be inspected. If they have been returned in the same condition that they were dispatched we will refund your order in full. 6. 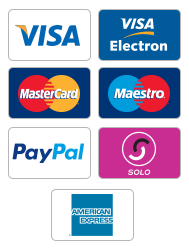 Your refund will be made to the debit/credit card or PayPal account used to place the original order. Alternatively, you may use this as credit towards another purchase if you wish. You will be advised by email when the credit for your returned order has been processed. This is normally within 7 days of our receipt of returned goods.